The Regina Pats (14-35-1-2) play a second road game in as many days on Wednesday night against the Calgary Hitmen (26-19-4-1). Puck drop is at 8:00 p.m. Regina time at the Calgary Corral, the site of the Pats 1974 Memorial Cup Championship. 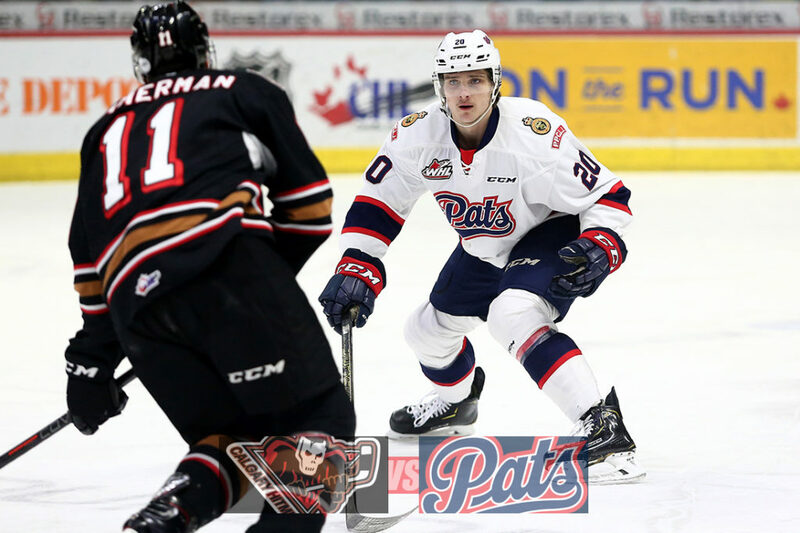 The Pats were in Lethbridge on Tuesday and picked up a 2-1 shootout win over the Hurricanes. The Hitmen have been off since Saturday when they beat the Red Deer Rebels 5-1. Tonight is the third of four meetings between Regina and Calgary in 2018-19, the Pats are 1-1-0-0 in the season series. Tonight’s game can be heard with Bennett Dunlop Ford Pats Hockey starting at 7:35 p.m. on 620 CKRM. 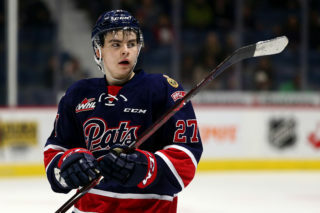 Max Paddock made 38 saves and two more in the shootout to lead the Regina Pats to a 2-1 shootout victory over the Lethbridge Hurricanes on Tuesday night. In the first, the Pats outshot the Hurricanes 13-9, but neither team found the back of the net and it was scoreless at the break. In the second, the goaltenders continued to stand tall. The Hurricanes outshot Regina 14-11 in the period but the game remained 0-0 after 40 minutes. In the third, the Pats broke through 1:15 in, Blake Allan tipped in his first with the Pats to make it 1-0. The Hurricanes tied it up with just over six minutes left thanks to Taylor Ross and it was 1-1 after 60 minutes. Max Paddock was sensational in overtime, stopping five Hurricane shots and it went to a shootout. The Pats got goals from Ty Kolle and Sergei Alkhimov, while Max Paddock stopped two of three and the Pats earned the extra point in a 2-1 final. The Pats were outshot 39-30, the powerplay was oh for three, the penalty kill was two for two and Max Paddock was named the game’s first star, making 38 saves. 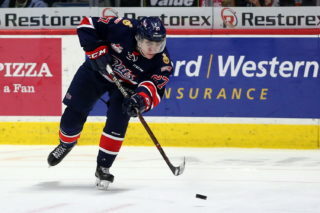 Forward Blake Allan scored his first goal in a Pats uniform on Tuesday in Lethbridge. The 17-year-old tipped a point shot in the slot to give Regina the 1-0 lead early in the third. Allan was acquired from the Kootenay ICE ahead of the 2019 Western Hockey League trade deadline. The former third round pick of the ICE has a goal and three assists in 45 games this year. 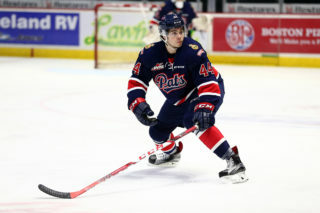 Pats forward Cale Sanders played in his first Western Hockey League game on Tuesday night in Lethbridge. The 16-year-old was called up from the Edge Prep School of the CSSHL where he has 16 goals and 33 points in 28 games. Sanders was signed by the Pats during training camp in 2018. 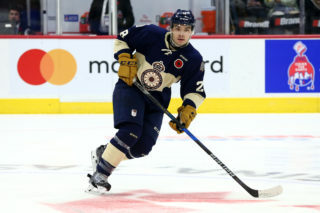 The product of Claresholm, Alberta appeared in four preseason games with Regina in 2018. Pats goaltender Max Paddock continued his stellar play in the second half of the season, making 38 saves on Tuesday night. The 18-year-old has gone 3-4-1-0 in eight starts since Christmas, putting up a 2.36 goals against average and a .932 save percentage. His goals against average in the second half is tied for fifth in the WHL and his save percentage is second best. Thanks to his strong stretch, Paddock’s goals against average has dropped from 3.93 to 3.53 and his save percentage has increased from .880 to .894. 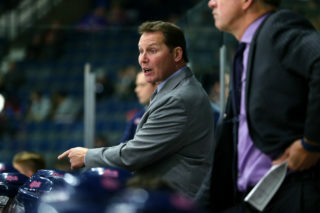 The product of Brandon, Manitoba has accounted for nine of the Pats 14 wins in 2018-19.